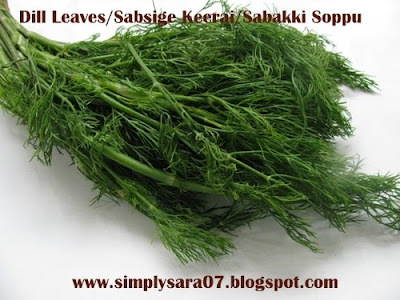 Sabsige Keerai/Dill Leaves is a type of greens and good for health. Its also called Sabakki Soppu in Kannada. My mom used to make it frequently back in Bangalore but we don't get this in Chennai:-( I never knew we get this in Singapore. Just the other day was so happy seeing this in a Chinese Vegetable Shop in Little India and immediately bought it. I just love the aroma of the leaves. Wash and chop the Keerai and Onion into fine pieces. In a Kadai, heat oil add mustard wait till it splutters, then add dal, red chilli and wait till its brown. Add onion and fry till its transperant. Now add Keerai and cook till the colour changes with salt and water. Once its done and no water is left its ready to Serve. Garnish with grated coconut and its good to have with Rasam rice. This is going off to Healing Foods Spinach by Divya and Siri. Note - You can also cook this in pressure cooker and later season it. 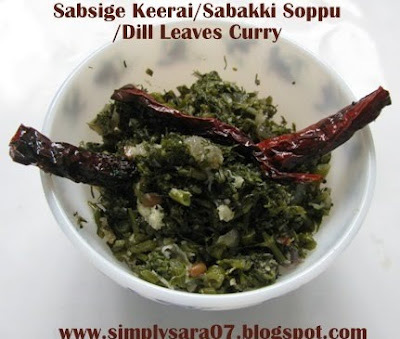 Very very healthy curry..used dill leaves in some of the dishes but,never made curry!! Good one Sara. I recently bought a bunch of dill leaves, will definitely try this out. Healthy and delicious...never had this before..
Never tried dill leaves as poriyal, sounds unique..
Lovely healthy dish ,Dill leaves sabji is eaten after childbirth for its healing properties. i never had or tried dis keerai....its healthy one! We love this soppu. I make akki rotti with this, chitranna, pulav, etc. Thanks for visiting TasteofMysore. i think this keerai is fennel leaf?